Why pay café prices when you can make your own? Size (inches): 9.49" X 9.80" X 12.01"
Make your espresso, cappuccino and lattes with the Via Veneto, a very accessible and ever fashionable Traditional Pump Driven espresso machine of high quality. 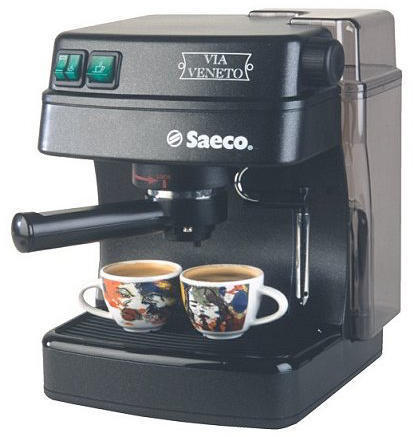 Saeco's Via Veneto is a white, compact Traditional Pump Driven espresso machine. Featuring a 15-bar pump, a pod adaptable pressurized filter holder for use with ground coffee or pods, the exclusive Pannarello milk frothing device and a removable 56 oz water tank. Special filter-holder in equipment on some single machines, that allows to obtain an espresso creamy like the one of the bar, with any kind of coffee and independently of grinding degree. The Pannarello is the perfect frothing device. Dispensing steam in three different directions, it is an essential key to making thick and creamy foam for cappuccinos and other milk based coffee drinks. The Pannarello also dispenses hot water for drinks such as tea, or instant soups. Never worry about measuring the perfect amount of ground coffee, simply use the Saeco Pod kit. The pod kit is a pre-packaged "tea-bag" like pod of packed ground coffee. Simply insert into your Portafilter and brew! This product is backed by the manufacturer's 1 year warranty. Saeco is the world's largest producer of espresso and cappuccino machines, coffee grinders, and related items. Because of this, they have been able to stay at the head of the pack for innovation and performance. They manufacture espresso machines that will fit anyone's budget and needs. They feature the super automatic series of automatic espresso machines like the budget priced Saeco Vienna or the top-of-the-line Magic Comfort Plus that will automatically grind and brew your coffee on the spot. Advanced features allow you to enjoy push-button operation, and perfect espresso and cappuccino. And one of the greatest features is that there is little or no mess! Easy to use, easy to clean. But they are also known for their conventional pump driven espresso machines like the popular Saeco Classico and the Magic Cappuccino. See why so many people choose Saeco for their coffee and espresso equipment! Well, just use a senso from Philips, the pads ere widly spread and it is much cheaper.